Northport Michigan 's roots lie in the lumbering, fishing and farming of the 1800's. In the lake 1840's, a smallpox outbreak resulted in people moving up the Leelanau Peninsula and settling around the natural harbor of what is today Northport. The surrounding area, Leelanau County, is the largest cherry growing region in the United States. Vineyards abound as well. Over the past 5 years Northport has experienced quite a rebirth, with an extensive investment in their marine and harbor facilities. Today, tourism is a major part of the local economy. Northport is a popular destination for cruising sailors. The approach into Northport Michigan is straightforward. Enter Grand Traverse Bay, standing east off Lighthouse Point about 3 nm. Then follow a course of approximately 210°T for 6.8 nm to reach buoy R"2" - a Fl RED with Bell. 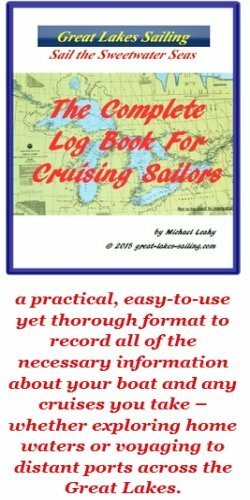 This course will keep you a safe distance off the Leelanau Peninsula coast which has a shoaling extention approximately 2.5 nm south along that course route. Once south of R"2", alter course to approximately 277°T and follow for 2 nm to reach the harbor. There will be 2 unlit, nun buoys (RED, cone-shaped)numbered R"4" and R"6" on the chart. You must keep south of these as they mark dangerous shoals to the north. Stand off Omena Point approximately 2 nm. Following a course of approximately 345°T for 5 nm will bring you to a point just south of R"2", a Fl RED buoy with Bell. At R"2", alter course to approximately 277°T and follow for 2 nm to reach the harbor. There will be 2 unlit, nun buoys (RED, cone-shaped)numbered R4 and R6 on the chart. You must keep south of these as they mark dangerous shoals to the north. The harbor is bounded by the shoreline on the north and west sides and a breakwater on the south and east sides. The entrance is at the NE corner. It is marked with a Q GREEN light, visible 5 nm offshore, positioned on the pierhead of the south breakwater. The west side of the entrance is marked with a Q RED light. Northport Village Marina has 100 slips with 67 set aside for transient sailors. Over the past few years, it has seen a significant redevelopment and upgrading. There is a fuel dock (diesel and gasoline) and a pumpout station. Water and power are available at all slips. The marina facilities have been rebuilt and include restrooms, showers and laundry facilities. Amenites include picnic areas with BBQ grills. There is internet access. There is a good anchorage area immediately to the north of the marina. Tom's Food Market, located 2 blocks from the marina, can meet your provisioning needs. Huntington Bank. located 1 block from the marina, has both counter and ATM service. Dr. Michael Zitter (213) 386-7147 operates a medical practice 4 blocks from the marina. K. Hatfield Pharmacist (231) 386-5164 is located 2 blocks from the marina. There is a good variety of restaurants and pubs to enjoy in Northport. North End Eatery has a pretty substantial breakfast menu and a casual, burgers and sandwiches lunch menu. For a refreshing cool beer, check out Northport Brewing, a well-regarded local brew pub. Tuckers of Northport is a casual pub/restaurant with 3 bowling lanes to enjoy as well. For wine lovers, pop into Motovino, a small winery and tasting room located right in the village. Also, check out the Tribune Ice Cream & Eatery for a hearty breakfast and, of course - ice cream! Just a few miles north of the village is Leelanau State Park. Here you can enjoy miles of walking and hiking trails, gleaming white beaches and rolling sand dunes. Located 9 mi/14.5 km north of the village is the Grand Traverse Lighthouse Opened in 1852, there are guided tours for visitors. In the village, there are interesting shops to explore such as Uniquities, a delightful antique and arts shop, David Grath's Fine Arts, Northport Pottery and more. The Northport / Omena MI Chamber of Commerce site will give you ideas of more things to do and see while visiting the area.